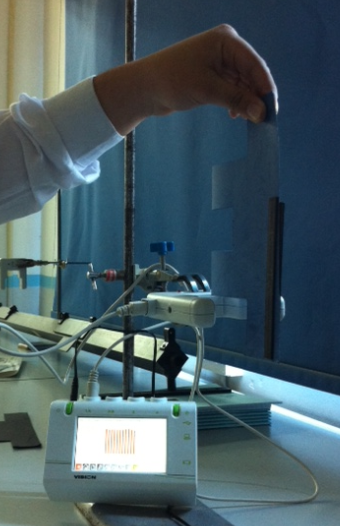 A datalogger is a device which collects and processes raw data from sensors such as light gates. This method involves dropping a double interrupt card through a single light gate connected to the logger, as you can see. People sometimes ask about the advantages of light gates. All they are is a start/stop timer – a reduction in light intensity turns them on, a restoration of normal intensity turns them off again and software does all the rest to calculate velocities, accelerations and so on depending on the configuration. They have a very rapid response time so they start or stop in a matter of microseconds. Also, repeat determinations can be done quickly and efficiently. The logger is programmed with the length of each interrupt card ( I used 40mm), weighted a little bit to minimise air resistance and dropped vertically between the light gates. The internal clock starts when the gate is interrupted and stops when it is not. 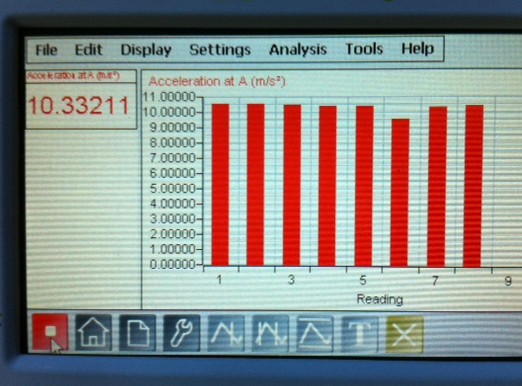 It then calculates the average speed of each part of the double card as it falls. One speed is greater than the other because the card is accelerating. The internal clock in the logger records the time between the interrupt cards’ fall. 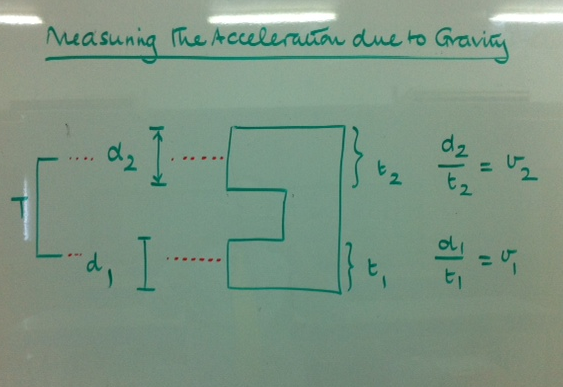 Acceleration = change in speed / time. The logger software can be used to display all speeds and times, or the calculated acceleration directly, which is simpler. Results were as shown. As you see, all readings (should all be 9.8) are in error by approximately the same amount. This indicates a systematic error in the readings, perhaps because the weight of the card is unevenly distributed or the card lengths are not quite precise enough. Here they are. I’ll leave this up for a few days for everyone to download it. Here it is again… Learn the shapes of the graphs, remember gradient of distance/time graph = speed, also velocity / time graph = acceleration. Area underneath speed/time graph = distance travelled. Click on the graphs to make them bigger, sorry about the image quality. 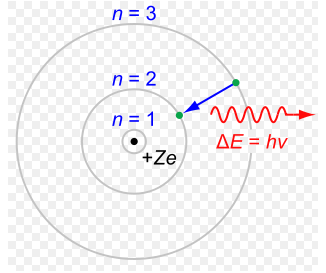 The great Danish physicist, Niels Bohr, gave us a model of the atom which we still use today. The Standard Model explains almost everything about the fundamental structure of matter. Everything in the Universe is made from twelve basic building blocks called fundamental particles, governed by four fundamental forces. This post has been updated to include the Higgs boson Our best understanding of how these particles and three of the forces are related to each other is encapsulated in the Standard Model. Terms can sometimes be confusing. A baryon is a composite subatomic particle made up of three quarks, example – protons and neutrons. Baryons and mesons belong to the hadron family, or quark-based particles. Mesons are composed of one quark and one antiquark and belong to the lepton family. Leptons (like electrons and neutrinos) do not experience the strong nuclear force. Developed in the early 1970s, it has successfully explained a host of experimental results and precisely predicted a wide variety of phenomena. Over time and through many experiments by many physicists, the Standard Model has become established as a well-tested physics theory. 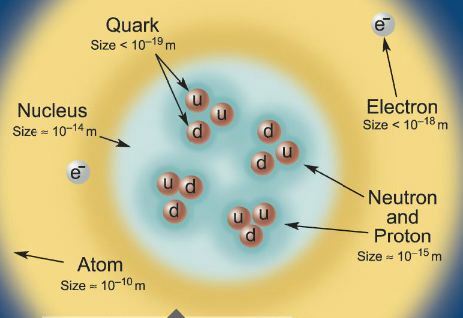 A neutron (udd) decays to a proton (uud), an electron, and an antineutrino. This is called neutron beta decay. Frame 1: The neutron (charge = 0) made of up, down, down quarks. Frame 4: An electron and antineutrino emerge from the virtual W- boson. The intermediate stages of this process occur in about 10-27s, and are not observable. Today, CERN announced after exhaustive experimentation that a muon neutrino – spectacularly hard to detect since it’s massless and without charge was clocked travelling 730 km from CERN in Switzerland to an Italian laboratory at Gran Sasso near Rome at speeds, impossibly, greater than the speed of light. It can’t be right. If it is, Einstein was wrong and we all have to start again.